This morning at the ISTE conference, Google (NASDAQ:GOOG) unveiled a series of products and tools aimed at the education sector. 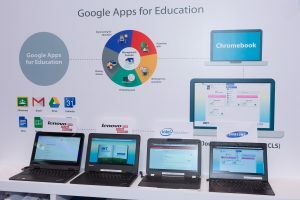 Google’s Chromebooks have become the go to computer system for educational purposes in the United States due to their low cost and wide array of applications. Now, Google is expanding its classroom capabilities and creating new tools for educators to strengthen its position in the classroom. One of the programs unveiled was Google’s Expeditions. Launched as a trial in September of last year, the Expeditions program allows students to take “virtual reality field trips” using a Google Cardboard viewer. The program currently includes more than 200 destinations, including Antarctica and Machu Picchu, and has been used by more than one million students to date. The Expeditions app currently works on Android, but will have an iOS version available in the near future. The company has also launched a free Chrome app called Google Cast for Education. The app works with the Google Classroom service and runs on the teacher’s computer that’s plugged into a projector, so there’s no additional hardware needed. Teachers turn their main computer into a Cast destination and then can approve Cast requests from students on a case by case basis. Students can share their Chromecast device screens using the existing “Cast” feature in the Chrome browser for an interactive lesson. Cast for Education is designed to work with wireless networks and allows both video and audio sharing. Google is also offering a trio of new apps for Chromebooks used in classrooms. These include a music and podcast making app called Soundtrap, a video project tool called WeVideo, and an interactive whiteboard called Explain Everything. The apps were created by Google’s partners and can be purchased together or as standalone subscriptions. Quizzes in Google Forms also received a new feature that lets teachers grade multiple choice tests and checkbox questions automatically. Now, teachers can add review materials that helps students understand why their answers were wrong and can disable a setting that lets students send themselves a copy of their responses. Forms has long been one of the most popular tools used by teachers for feedback and many have requested the ability to directly integrate quizzes into it.